Cool design, only concern I have is that the blasters might be too spaced out. Aside from that it looks great! Love how rakish and jaunty she is. And much better proportions and styling than the Scimitar. No more gooseneck! I always found the Scimitar nicely streamlined for a Sienar bomber, but that really ain’t saying much. I like these better. It’s hard to make a bomber pod design that doesn’t look like a bad TIE/sa kitbash. External missile tubes do seem much more ergonomic-dunno how much non-capital-scale SW ordnance demands anything bigger. Funny how standardized fighter/bomber projectiles seem to be in that regard. Those looks strange for me because the launcher tubes are directed to the bottom-rear and if you shoot with proton torpedoes or something that is have even less maneuverability it maybe a large time and radius to change direction to the something before you. Have you seen the rate of turn exhibited by Luke’s torps in ANH? Star Wars missiles seem to have absurd rates of turn, but you need to get really damn close to guide them in against heavy jamming. I think he was using the Force to guide them. The two frontmost launchers in the middle row seem to be stuck in hull geometry, but since this is a WIP I’m confident it will get fixed on the way. Yeah those are basic blocking shapes. Haven’t gotten there yet for detail work. Nice sense of streamlined bulk WRT this thing’s fuselage & wing panels. Is a ship like this intended to have landing gear or does it launch/land from racks like a more conventional TIE? Probably rack-mounted; the wings aren’t really shaped for floor parking, and there’s not a lot of ventral fuselage space for retractable skids. What about the old Vulture Droid (Clone Wars)? They hoisted their pylons into walker configuration while entering or moving around in docking bays. 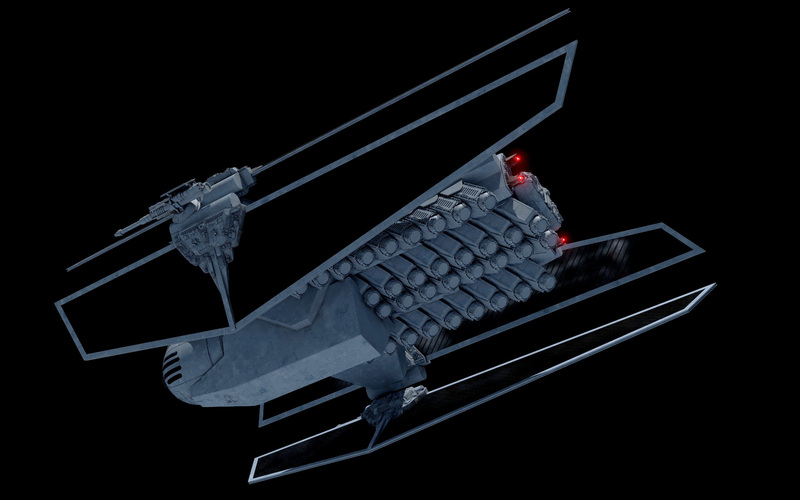 Repulsorlift hovering seems handier for most manned fighters, though now I’m pondering whether vulture droids doubled as hangar/external security or were expected to deal with repulsor-jamming-heavy theaters. They seem to have been designed to have secondary functionality for police actions. Being able to walk around gives more flexibility in law enforcement than a pure aircraft. So are bombs from a craft like this gravity bombs or do they have a little pusher drive to make them fall? This looks like it would rain an unholy fall of explosives. They are just launchers – can do freefall bombs or missiles, just like a Scimitar. Holy crap this look like a Scimitar Assault Bomber on steroids! 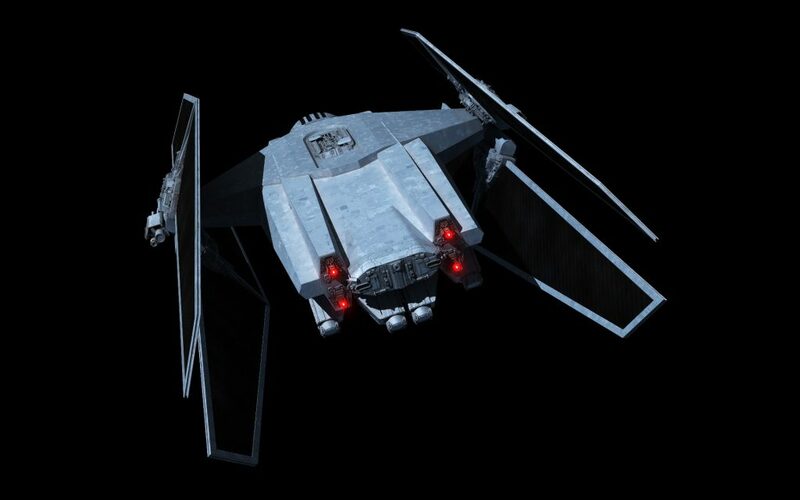 I wonder if a dorsal turret might make some sense on a heavy bomber like this, à la Y-Wing, IL-2, or ARC-170. Can the wing guns pivot, or are they fixed? The radiator panels would limit a turret on the main body of the craft to a very narrow firing arc either to the front or to the rear. A ventral turret might fare a little better than a dorsal one but all in all it seems impractical. 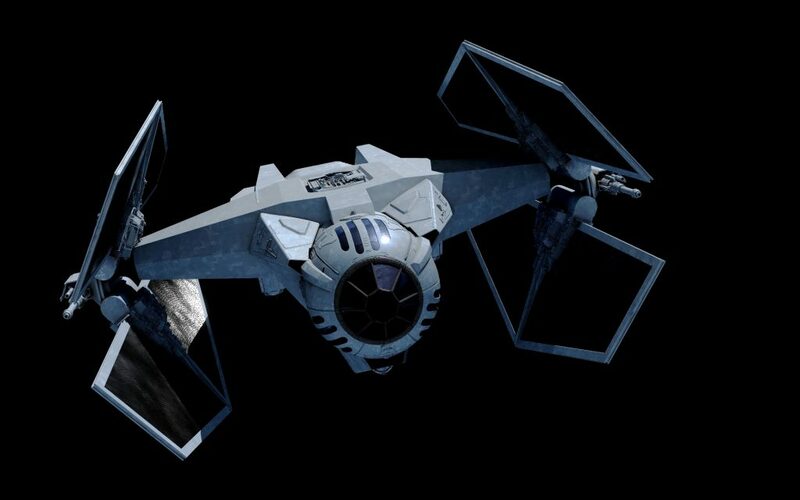 A Y-wing-scale light dorsal turret might have a decent arc WRT threats from above & behind, though SW fighters’ best defense is basically evasion. Those wing guns look fixed to me, though I see no reason a few of those ventral/aft missile tubes couldn’t be loaded for tail coverage. Come to think of it, fire-and-forget projectiles might be handier for SW light strike birds-less need to level out so your gunner gets a shot. Really like the TIE Mangler look here as a bomber! Wonder if this would be consider a predecessor (as a research project but was deemed to expensive for production) or the successor to the Scimitar. That Scimitar/Mangler-style cockpit is a very reuse-worthy component. Speaking of which, those guns look familiar-I get the impression this one might be a heavier antiship/antiarmor platform, whereas Scimitar was intended to keep up with Interceptor-ballpark escorts. Both seem to have 4 engine nozzles, and the Scimitar only seems a bit lighter. This baby has far more launch tubes though, and more radiator area to work with. Perhaps it’s just a more expensive, higher end version, like a Defender compared to an Avenger. TIE Leveler perhaps? So somewhat like an SU-34 compared to the previous generation SU-25? Complete with low procurement numbers from the extreme expense it takes to procure them. One of the Hull 721 duology’s neater bits involved the nigh-byzantine intricacy of its small-craft clashes, so color me very much on board with this high(tonnage+space)/low mix policy…though I can’t help noticing some overlap between Sienar bombers & Lambda-cousin gunboats. Perhaps the latter are better suited for detached patrol duties and/or fast corvette hunting? The gunboats are a lot bigger than TIEs (well most TIEs) – the basic platforms seems to be fundamentally different. 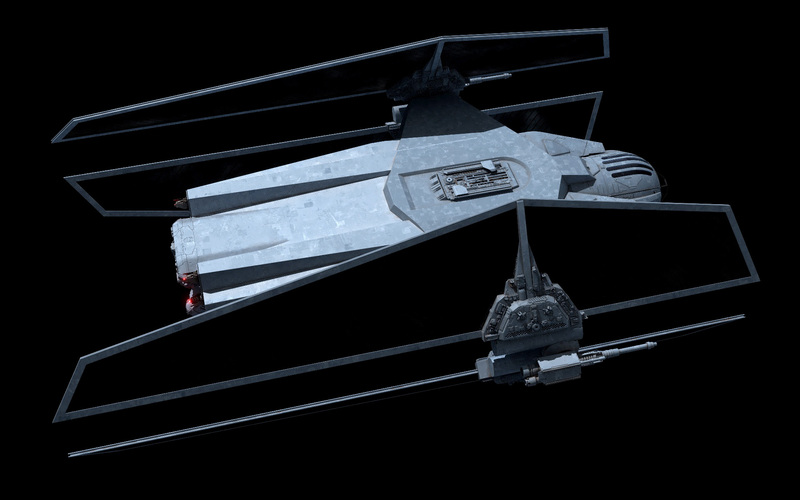 I think the gunboats and cousins are more long range craft analogous to the big Old Republic/Rebel fighters, and only later TIEs with sufficiently miniaturized hyperdrives starting to overlap with them in that niche. In a strike they can co-exist with TIE series stuff easily, and there might be some political/industrial considerations as well with having them procured in small numbers alongside the TIE series craft.